COLLEAGUES: Adel Bozorgzadeh, director of the transplantation program, talks with Berk. When he steps out of his office into the long corridor that connects Strong Memorial Hospital to the Arthur Kornberg Medical Research Building, Bradford C. Berk often walks by a portrait of George Hoyt Whipple. The painting of the founding dean of the School of Medicine and Dentistry who helped design what has become today’s Medical Center is one of a series depicting the doctors who have led medical education and research at Rochester since 1921. For Berk, who became senior vice president for health sciences and CEO of the Medical Center this August, the faces are more than historical references. “I personally knew six of the seven medical school deans, including Whipple, who died when I was a medical school student,” says Berk, who graduated from the School of Medicine and Dentistry in 1981 with a joint M.D./Ph.D. degree. Setting a course for the future is one of Berk’s top duties as chief executive of the $1.7 billion enterprise that makes up the Medical Center. Those duties include overseeing Strong Health, the University’s patient care network that includes Strong Memorial Hospital, Highland Hospital, the Visiting Nurse Service, and other clinical programs throughout the Rochester area. As senior vice president, Berk, a widely published cardiovascular scientist, is responsible for overseeing research programs throughout the School of Medicine and Dentistry, the School of Nursing, the Eastman Dental Center, as well as in several research centers and interdisciplinary programs. He succeeds C. McCollister Evarts ’57M (MD), ’64M (Res), who has been senior vice president and CEO since 2003. Berk has seen firsthand—and helped guide—some of that progress. In 1998, the native of the Rochester suburb of Brighton was recruited to the Medical Center after holding academic appointments at Harvard Medical School, Emory University, and the University of Washington in Seattle. At Rochester, he has served as chief of cardiology and director of the Center for Cardiovascular Research (now known as the Cardiovascular Research Institute), and as chair of the Department of Medicine. “We have a great opportunity to build on the strengths that have accrued over the last eight years,” says Berk, noting that in that time the Medical Center has added two new research buildings, doubled its funding from the National Institutes of Health, and added nearly 100 faculty. One of his first priorities is completing a yearlong strategic planning process that he hopes will guide the Medical Center’s direction over the next 10 years. He says Rochester could be a leader in several fields that show enormous potential to change the health of future generations. Those areas include regenerative medicine (including research on stem cells), nanotechnology, aging, and obesity. Bradford C. Berk decided to be a doctor because he liked the balance it provided between the study of science and the interaction with people. And he’s not going to let a small duty like running a $1.7 billion academic medical complex get in the way. Berk, a graduate of the School of Medicine and Dentistry who returned in 1998 as a faculty member, says he plans to continue seeing patients while he assumes the role of senior vice president for health sciences and CEO of the Medical Center. The commitment is a little unusual for a top executive, but Berk says it’s important to him. 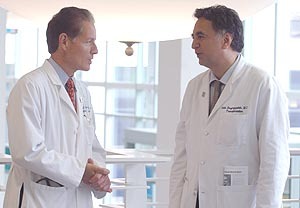 in addition to helping direct the Cardiovascular Research Institute and serving as chair of the Department of Medicine. While he plans to give up his rotations in the hospital while he is CEO, he will continue to find time for his practice. “As a clinician, my number one commitment is to take care of my patients and to improve their health,” he says. “As a scientist, my job is to understand human disease and to make discoveries that will improve human health. As a scholar and administrator, Berk has led his own programs into national prominence over the past several years. A noted researcher who studies the cellular mechanisms behind vascular and cardiac diseases, Berk, along with codirector Mark Taubman, has led the Cardiovascular Research Institute (CVRI) to increase its annual funding to more than $12 million. The Department of Medicine has added 84 new faculty members, helping to drive a 15 percent annual growth in research revenues and a doubling of patient care revenues. This year, the CVRI is moving to an 84,000-square-foot building formerly owned by the Wyeth pharmaceutical company. Once there, the institute plans to increase to about 250 people and establish itself as one of the largest and most prominent centers dedicated to cardiovascular research in the country. Berk also has led an expansion of cardiac patient care services, launching a successful heart transplant service, expanding programs to treat deadly arrhythmias, establishing strong regional services, and adding new preventive cardiology programs. As chair of medicine, he has developed new Hospital Medicine and Geriatric Medicine divisions, and boosted access to cardiology, pulmonary, nephrology, and rheumatology programs. Victor Dzau, the chancellor for health affairs at Duke University and the president and CEO of Duke’s health system, says Berk has distinguished himself as a physician, scientist, and administrator. Already one of the most significant providers of health care in the Rochester region, the Medical Center has deep connections to the surrounding communities, ties that Berk expects to strengthen. Coordinated by the Center for Community Health, the Medical Center conducts about 300 programs designed to improve the health of Rochesterians. Helping Rochester become a thriving and economically vibrant community is one of Berk’s key priorities, and he says the Medical Center should play a leading role in that effort. As the University became the area’s largest employer this winter, it has taken on heightened responsibilities to participate in economic development, he says. That includes finding better ways to tap into the intellectual energy of institutions like the University and the Medical Center to identify potential startup and spinoff companies, to secure venture capital, and to create an environment in which new ideas, new approaches, and taking prudent risks are valued. Berk has seen the fortunes of the community change with the University and the Medical Center. As a Rochesterian, an alumnus, scholar, and doctor whose own connections to the place run deep, he wants to see the community prosper. “I see the current situation as filled with opportunities,” he says. “The threat is not to take advantage of the opportunities—not to go forward.